We were asked to bring along a limerick, so this is what I wrote – we were given the first line to get going. From new friends with experience in travellin’. I loved the bush poetry from some of the others there and it’s inspired me to ‘have a go’. 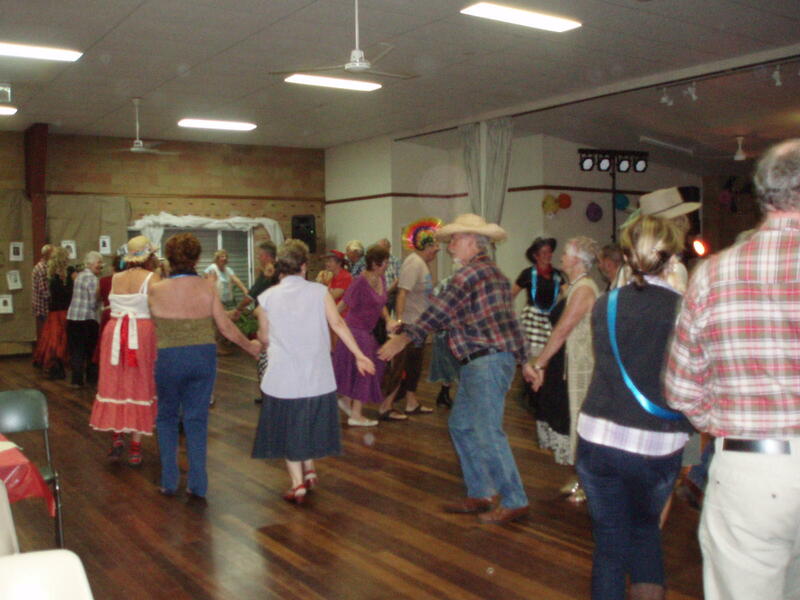 Heaps of activities to choose from so I went along to the Line Dancing lesson – yee haa! I worked up a sweat learning really basic steps, but when the music was added I discovered I am hopeless. So bad in fact that when I got back to Bundaberg and was giving Lauren a demonstration of my line dancing abilities she laughed so hard that her mouthful of lemonade came out her nose. Next time I’ll try Square Dancing. Here’s my poetic take on today. I’d planned to do this every day but somehow other things got in the way, so this is it! 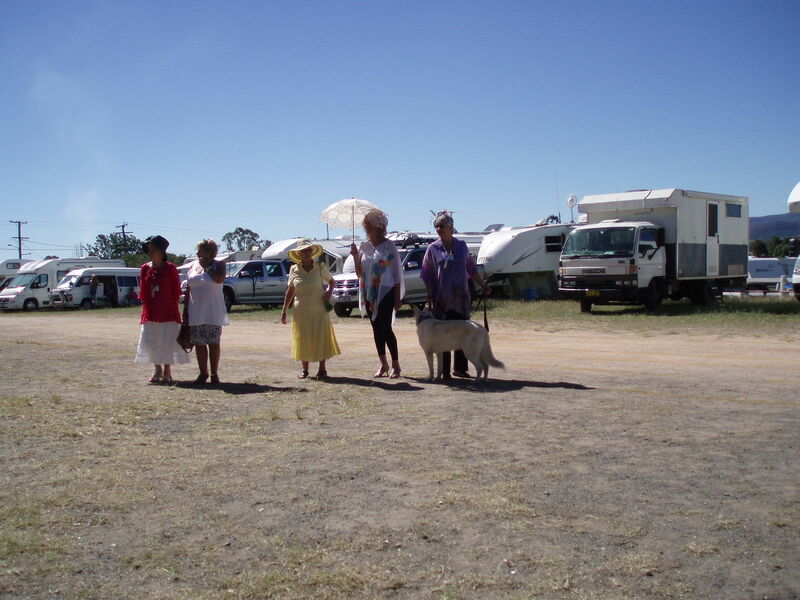 And lined up for dancing – can you believe it? Then they put on the music – disaster! But more practice will make me a master! And give it just one more chance. Well, the truth is, I never went back to Line Dancing lessons. Once was enough. I did try to practice the steps in my head but I couldn’t even get them right there. 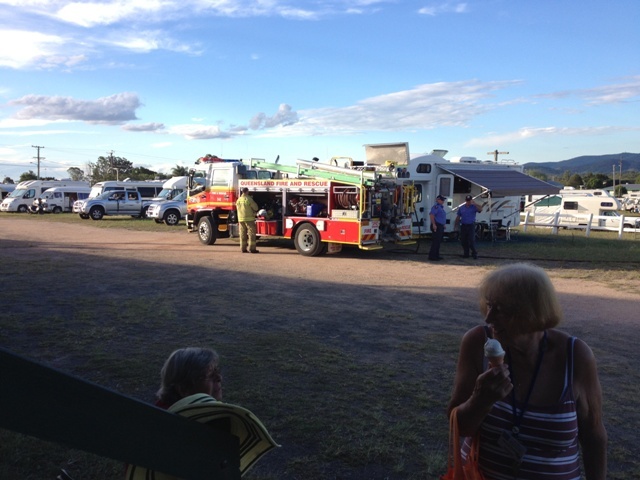 The local Bush Fire Brigade gave us info about different types of fires and the best way to put them out. 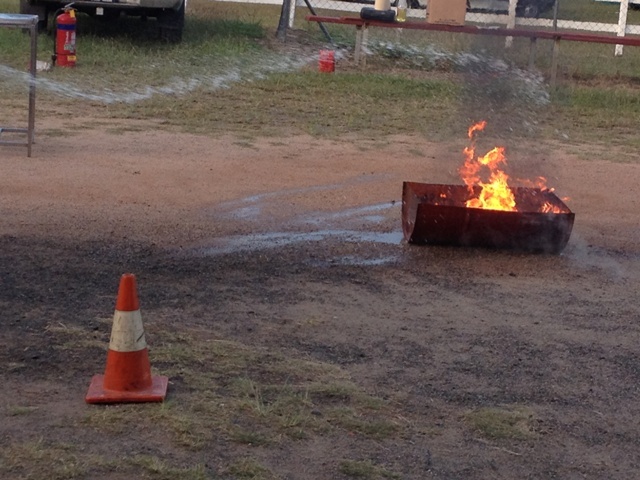 They demonstrated an oil fire and a diesel fire and how quickly they spread if water was used to kill them. I promptly went out and bought myself a Fire Blanket and a smoke alarm to install in the van. I already have a Fire Extinguisher, although have been warned that if a dry powder extinguisher is used you will spend forever after trying to get the powder out of every corner and crevice it can find. 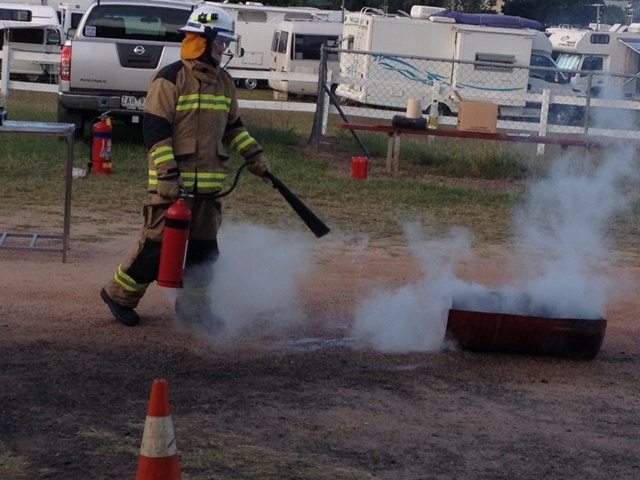 The fire demonstration was particularly pertinent as one of the Solos lost everything on the way to the rally when she got a flat tyre. She pulled over to the side of the road as soon as she could, but the heat from the wheel caught the dry grass underneath and lit a fire. 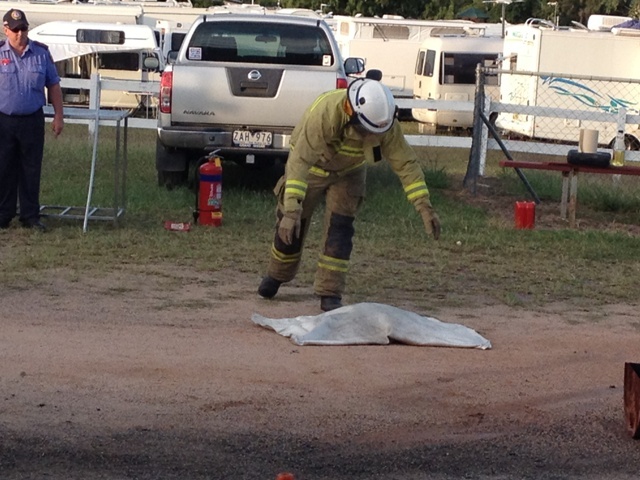 Some passing motorists could see what was happening and dragged her out of her van and it burnt away to nothing. She was left with only the clothes she was standing in. Wednesday night was Trivia Night. That made perfect sense to me as it has always been my Trivia Night with our team at Sharks on the Gold Coast. Some of us first timers made up a team of 8 and yes – we were equal winners. A bag of Fantales was shared around as the prize. So here is some Trivia for you…. What is a baby Tasmanian Devil called? 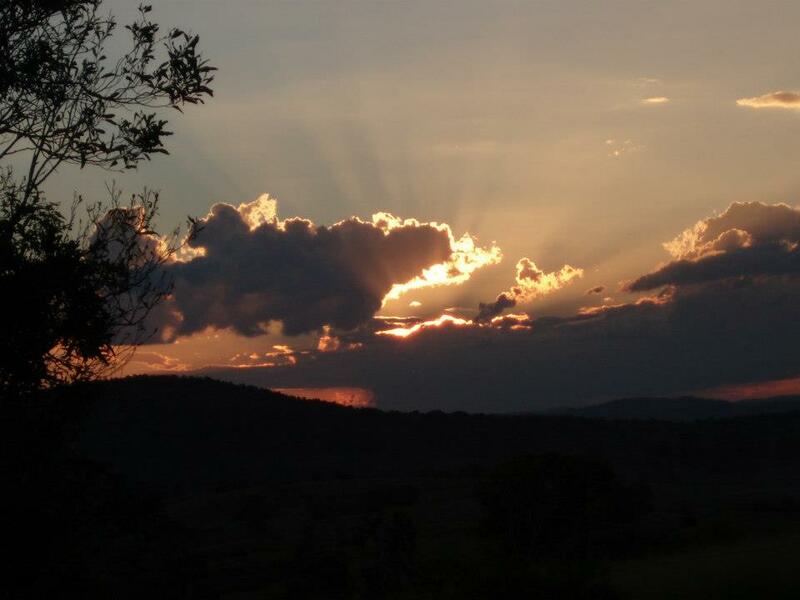 Which town is further north, Alice Springs or Rockhampton? Thursday night was Shindig in the Barn. 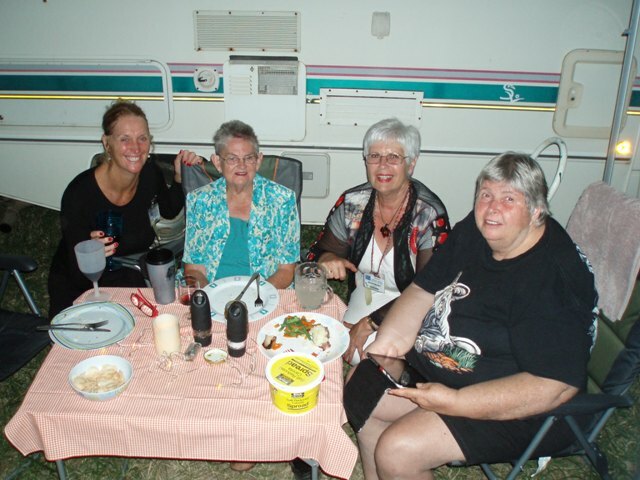 Some of the locals provided a corn beef and vegetable meal for all of us and then the country music started and with lots of yee hahs the night wore on – and on – and on! Have you guessed by now that I’m not a fan of country music? Before the Shindig a bus load of us went on a Sunset Wine, Cheese and Photo tour. 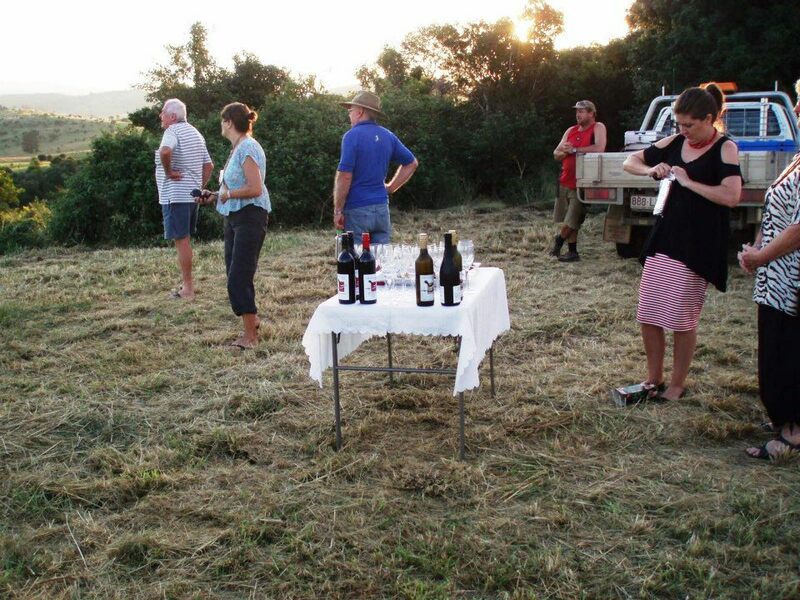 The wines were provided by a local Childers Winery called Hill of Promise Estate. I really enjoyed their Red Wren Merlot and it went down really well with the lovely cheeses, dips and bikkies provided by Coffee Pozzee from Biggenden. 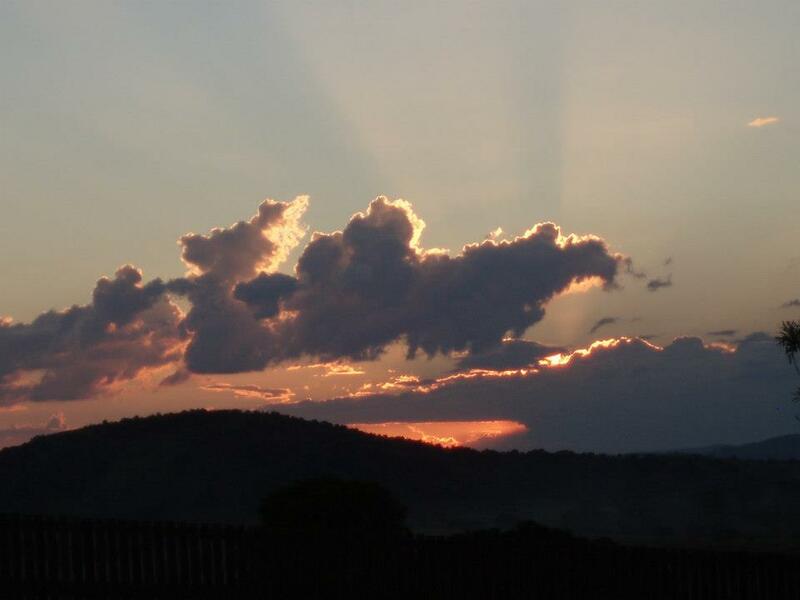 I’m no great shakes as a photographer but it was hard to go wrong with this beautiful sunset. We walked a short way up the hill to capture the best of it. Saturday was Market Day and lots of the Solos had stalls as well as locals who came in with crafts, fruit and veg, books, jewellery and other bits and pieces that typically make up a market. Many travellers supplement their income by making things to sell – usually crafts of some sort, but also useful items like bags to keep your hose and power cord tidy and accessible. Saturday night was a group dinner of pies and mushy peas and then – you guessed it – another Country singer hit the stage. I had a fairly early night! Our final day was Sunday and we started breaking camp for an early exit Monday morning. That pop up ensuite that was so easy to put up will NEVER go back in the bag it came out of so will have to lie on my bed when I am travelling. I believe this is how everyone carries them because no-one has EVER got them back in their bag! There was a Picnic Race Meeting in the afternoon. Go on, ask where the horses are and then I won’t be the only idiot! The jockeys were pulled out of the crowd and lined up at the start with different coloured pool noodles (the horses). Then a dice was thrown to see which horse moved, and then thrown again to see how many steps they would take towards the finishing line. There was a tote going, betting was lively and the cheering loud as we urged our horses over the line. No race day would be complete without Fashions on the Field and one of First Timers, Lyn, took out the prize with her gorgeous outfit from Coffee Pozzee ( they sell clothes as well as coffee as well as organise Sunset tours with wine and cheese!) and a parasol she just happened to have in her van to return to her daughter. So my first Solos Rally ends. 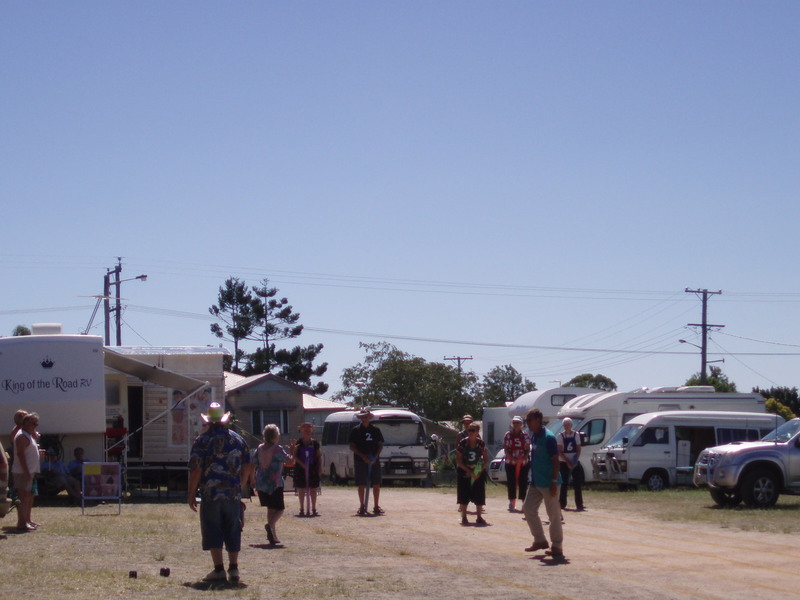 I’ve already booked into Bingara in October and can’t wait to catch up with people I’ve met here at Biggenden. 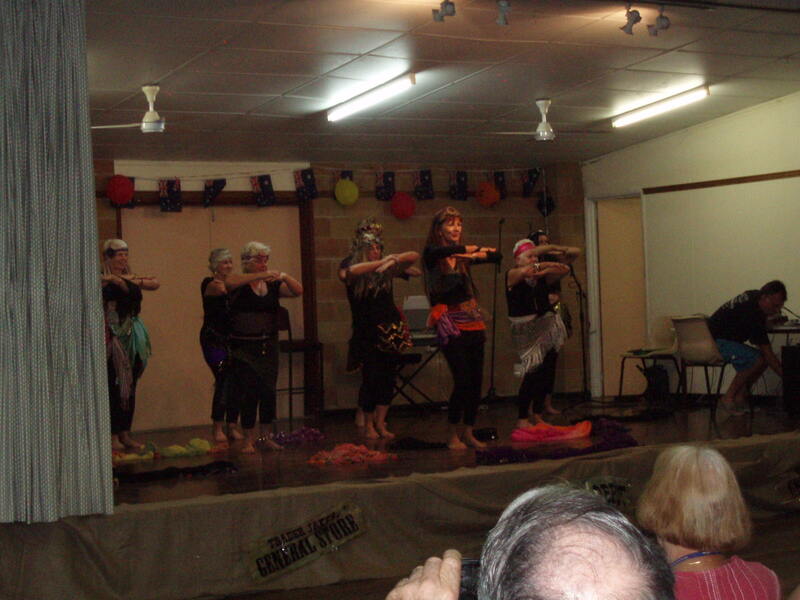 Categories: Rallies & Events, Travelling | Tags: Biggended Solos Rally, bush poetry, line dancing | Permalink. Hi Rosemary, I was a Solo for 4 years and miss them – because Richard and I are together, we cannot be Solos. It was great meeting you In Tasmania. We will be going away next year – hope to catch up with you on the road. Please remember me to the Solos – I’m sure that some of them will remember me.